For shits and giggles I like to search "Jacques Derrida" in the Google News search engine to see if the posthumous philosopher has made any recent headlines. 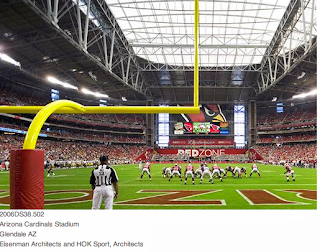 Meanwhile, Peter Eisenman spent the 1980s conceptualizing deconstructivist architecture with Jacques Derrida and the naughties building a stadium for the Arizona Cardinals. Does this stadium look "deconstructed" to you? You know, unless they were deconstructing deconstruction while they were constructing the stadium, and the financial backers standing over their shoulder, making mandatory suggestions. I wonder if there are multiple blueprints for this thing, and if some of it's earlier pre-carnations were a bit more radical. It's also interesting how many places intellectual celebrity can put it's hands.